Step One - Bolt the top mounting bar to the vertical adjustment rail with two of the stainless-steel bolts provided. Only finger tighten the bolts - you will fully tighten them in a later step. Step Two - Bolt the dock mount assembly to the vertical adjustment rail with one stainless-steel bolt and finger tighten. Position the dock mount assembly at the appropriate height to rest on the side of the dock structure the stool is being mounted on. Step Three - Bolt the seat and foot rest onto the seat rail using the two flat-head stainless steel bolts and finger tighten. The foot rest should be bolted directly below the seat and can face either direction. Step Four - Slide the seat and foot rest assembly onto the vertical adjustment rail. You are more than half way done already! Step Five - Install the seat stop bolt to the bottom of the vertical adjustment rail. This step is very important. If not installed correctly, the seat could slide off the bottom of the vertical adjustment rail…and when we say the seat has adjustable heights, we don’t intend the bottom of the lake to be one of them. Step Seven - Mount the Dock Stool to the dock (seems like a logical step). Check that the dock mount assembly sits on the side of the dock. If needed, adjust up or down to ensure it is in the proper position. Now is the time we have all been waiting for… You can now fully tighten all fasteners! Seat Adjustment – Control how wet you want to get in the water, or adjust you Dock Stool’s seat height to work for every member of your family. It’s easy! Just lift up on the seat and swing it out, move it to the desired hole, swing the seat back and push down again. Some of us are visual learners. 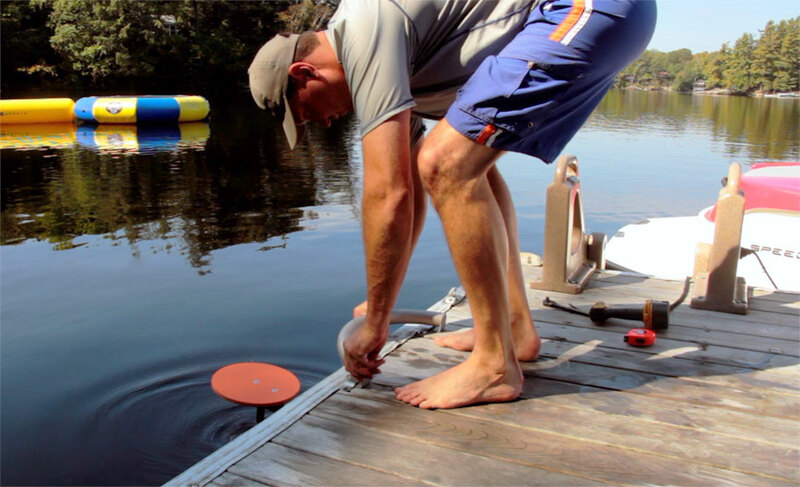 If that’s you…check out our step by step video and you will have your Dock Stool installed in no time!